When squash comes a knocking, I put it to delicious use in so many recipes, including this pinto bean chili. 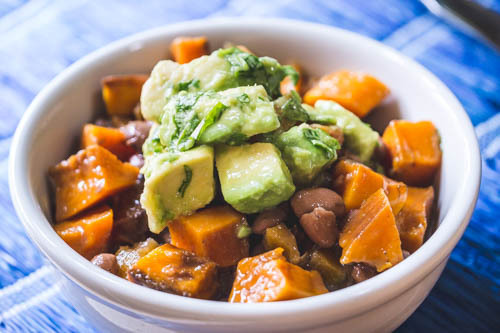 This is a classic chili recipe with the addition of the sweet and savory oven roasted butternut squash. Yum! Try it for yourself, and let me know if you like it. Soak beans in water for 8 hours or overnight. Bring beans and 5 cups fresh water to a boil. Skim the foam that rises to the top and discard. Add kelp, cover and reduce to simmer for 45 minutes. After 45 minutes, add 1 tsp. salt and continue cooking an additional 45-50 minutes. While beans are cooking preheat the oven to 375. Place cubed squash into a mixing bowl and drizzle with olive oil. Toss squash with nutmeg, cinnamon and a couple of pinches of sea salt. Put squash into a roasting pan and roast 40-50 minutes, or until lightly browned. In a deep saute pan or soup pot, saute onion in 1 tbsp. olive oil and couple of pinches of salt, on medium high heat. Add chili powder, cumin, chipotle powder and continue cooking 2-3 minutes. Add celery, carrots, garlic, tomatoes, peppers, and oregano and cook additional 2-3 minutes. Add cooked beans (plus 2 cups of the bean cooking water) into the saute pot, plus remaining 1 tsp. salt and black pepper. Add more bean water if you want a looser chili. Combine diced avocado, cilantro, lime juice and few pinches of salt, for garnish.